The Uprooting is a documentary project that explores the refugee crisis through the stories of its protagonists. It aims to go beyond the daily headlines and forefront the voices of refugees in an examination of the traumas of war, the challenges of exile and the contours of an evolving diaspora. 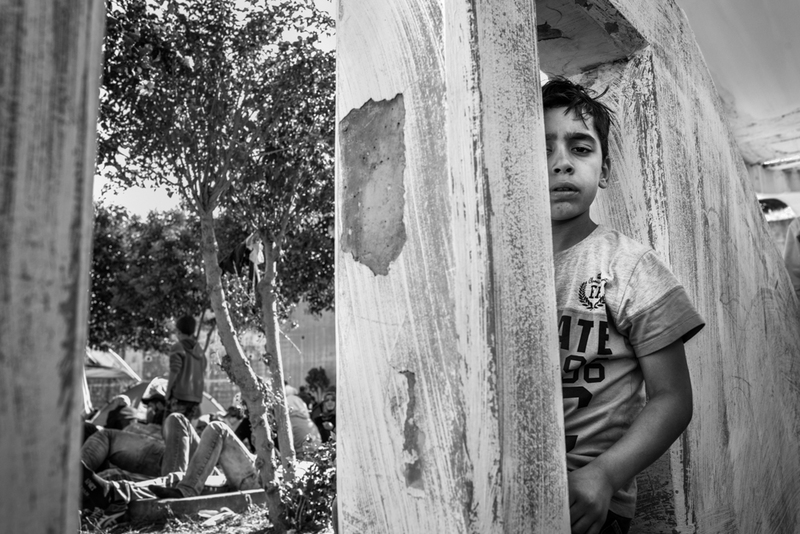 The first part of the project, "Stories," is a collection of interviews with refugees in different stages of the prolonged and problematic process of migration—beginning with people making arrangements to be smuggled out of Turkey and ending with those who have been granted asylum in countries like Sweden, England, and Germany. The Uprooting's second part, "Places," displays the work of photographers who have been documenting the crisis in the different places where it continues to unfold. The Uprooting aims to become an open platform so that different actors can make contributions. We hope that more and more refugees and photographers add their own stories to this growing polyphonic narrative of mass migration. 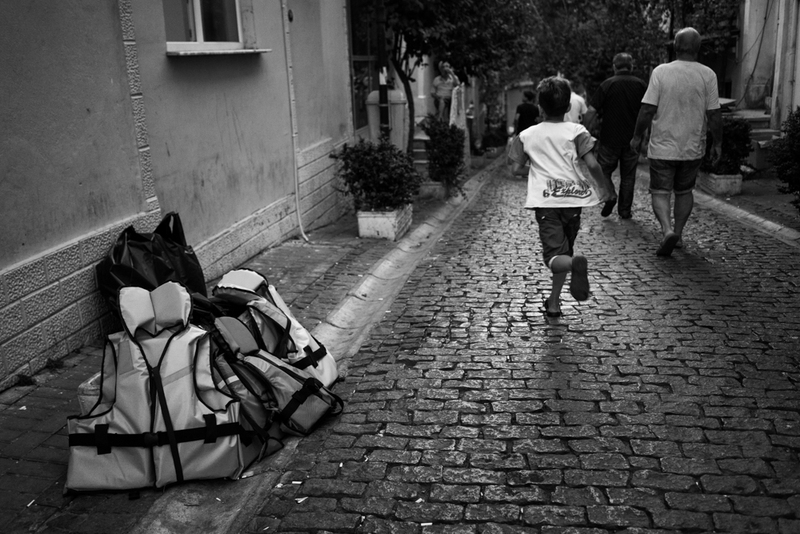 A boy runs by a pile of life vests for sale on the streets of central Izmir, Turkey's third largest city, and a current hub of human smuggling. A Syrian boy waiting in vain in Istanbul's bus terminal, together with some 500 people, for permission from Turkish authorities to board buses to the Greek land border. 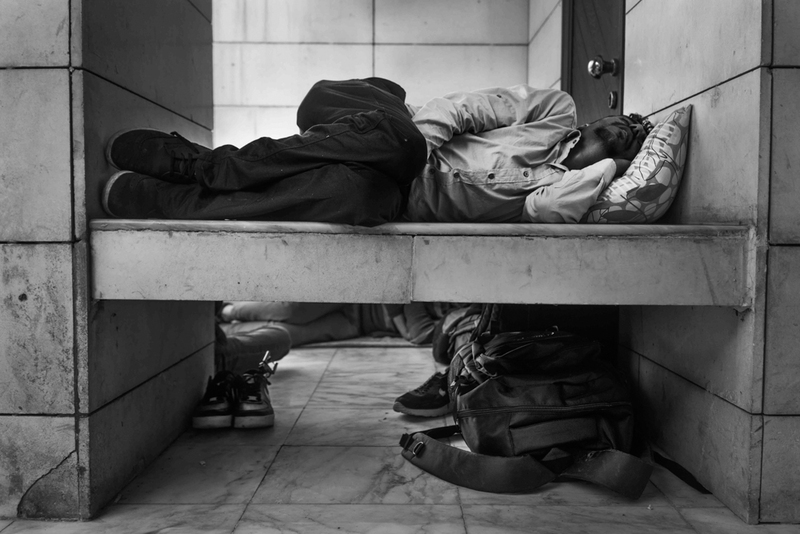 An exhausted refugee sleeps at Istanbul's bus terminal, where hundreds of refugees were holding a sit-in. Syrian refugees wait at Esenler Bus Terminal. They were aiming to reach Greece by land and thus avoid the known dangers of crossing the Aegean Sea, but Turkish law-enforcement eventually evicted them from the bus station a few days later. 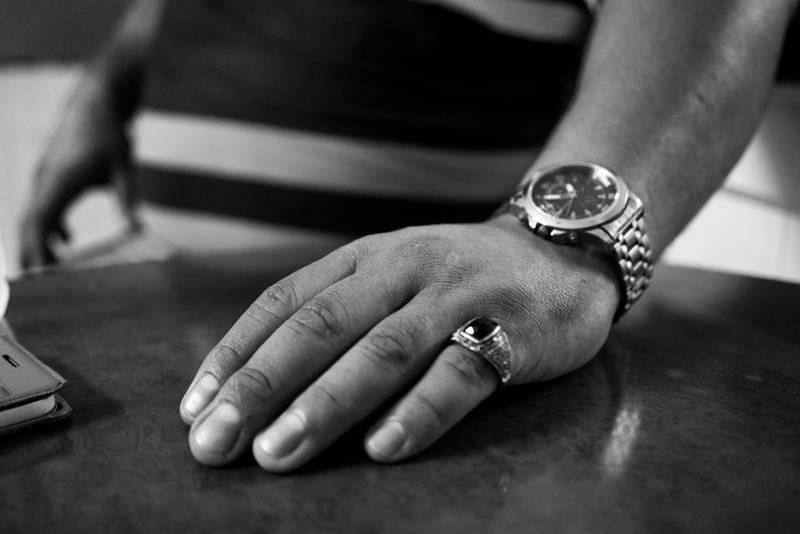 al-Khal (The Uncle), a 38-year-old Syrian who heads a human smuggling operation in Izmir, wears a solid ring crowned with an obsidian on his pinky finger—a gift from an Iranian family he smuggled to Greece. He claims to have made over two million dollars in the last two years. 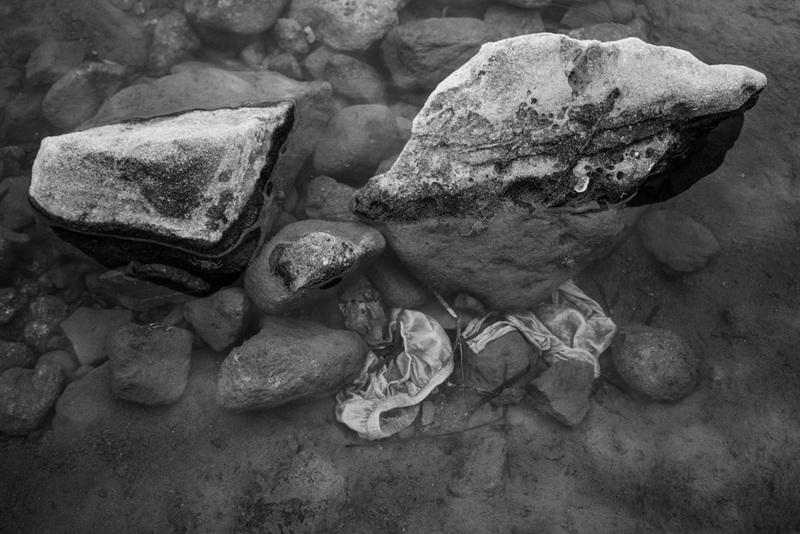 Remains of refugees' posessions floating in the waters of a beach close to Çesme, Turkey, used as a point of departure to cross to the Greek island of Chios, less than ten miles away. September 26, 2015. 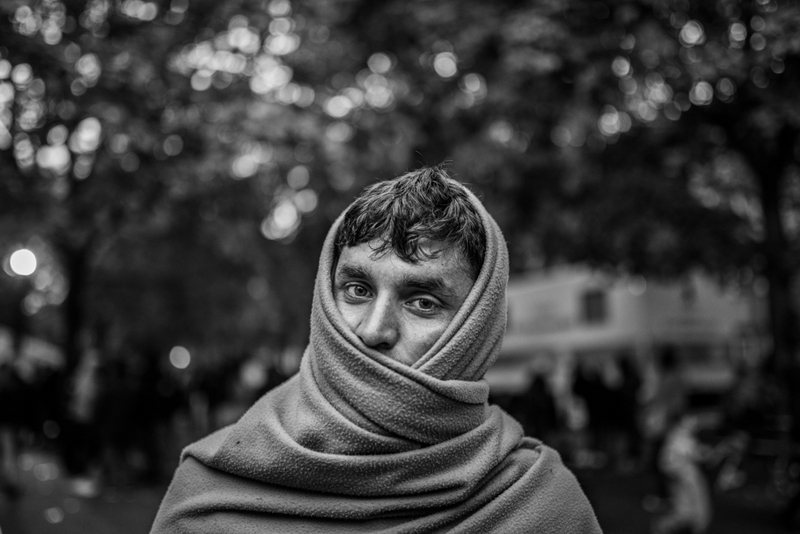 An Afghan refugee waits for a registration number in the courtyard of the social services offices in Berlin. The number is just a first step towards an initial appointment with migration authorities and does not guarantee success in the asylum application, which is a months-long process. 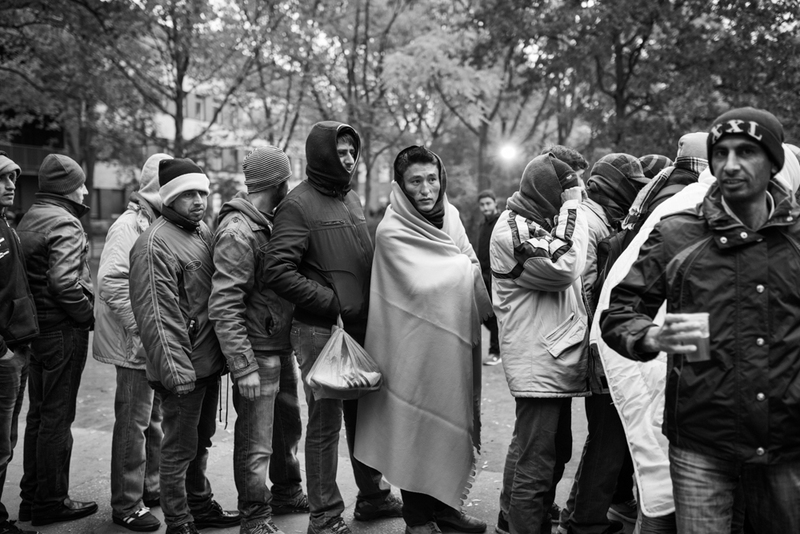 Afghan, Pakistani, and Syrian refugees line up for a warm cup of coffee handed out by volunteers outside the registration center for refugees in Berlin. In late October, recognizing the inefficiencies of the system and the incoming winter temperatures, German authorities opened a second registration center in the capital. The Uprooting is a collection of refugees' stories.